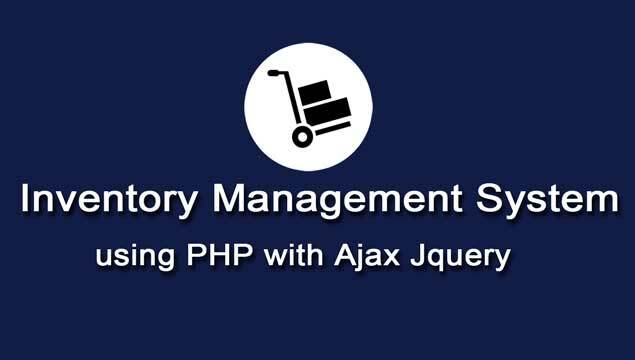 This Inventory Management System is an Open Source Project which is developed by using PHP PDO, Mysql Database, Bootstrap Library, Ajax and Jquery Datatables plugin. This system is web based application and this created by using PHP PDO, Ajax, Jquery Datatables plugin, Bootstrap Library and Mysql Database. This system will provides features like manage category, brands, products, order and report to user. This is web based system then master user can operate this system from any place by using any device, because this is web based and it's design is responsive. So we can access this system by using any device. So web based Stock Management system produce it easy to keep your stock perfectly from any location. Stock control is one of the main fundamentals of any developed businesses and this system will help to increase their business stock accurately. Web based Inventory Management system has uncounted benefits as compared to desktop based system, because it is accessible from anywhere you just you will need internet connection and you can check your item stock status from your mobile device also. On other use of developing Web based Inventory management system is that multiple user can gain access it on the same time. Following are the feature of this system. display product amount and total amount on create order page . hi, i downloaded the code, when i click update (edit) on order page modal not showing, but i try on your site is working, how to fix this? Hi, Enter "password" in password field, after this you can login into system. hello sir, you get a bug when clicking on order datatable column. after you try to search, this pagination will not change..
and, when i try to click the order button on specific colomn. it will not ordering ascending or descending..